I’m back! The honeymoon in Vermont was wonderful and involved much culinary delight. Phil and I usually camp when we vacation, so a resort and spa experience was a fabulous change of pace. But it turns out that rest and relaxation can sometimes come at a heavy price…i.e. the numbers on the bathroom scale. Since neither Phil nor I are willing to go gently into that dark night of marital couch-potato-dom, we’ve revisited our commitment to making better food choices. Actually…he requested I fully take over our menu-planning and I gleefully handed him his first bowl of plain oats with cinnamon. After he threatened to divorce me a few times, his palate adjusted and I now consider him one of my foodie converts. Since no weekend breakfast can be considered complete without pancakes (not for a chainsaw-wielder like Phil anyway), I decided to start making ours with whole wheat flour. After all, it’s not about depriving yourself of favorite foods, it’s just about making healthy substitutions with the foods you already love to eat. We were both pleasantly surprised with how good, fluffy, and flavorful these pancakes turned out. I’ll be making them this way from now on. Heat a nonstick pan or griddle on medium heat. (If you don’t have non-stick, you’ll need to use oil or butter on your pan so that the pancakes won’t stick.) Mix the flour, sugar, baking powder, and salt in one bowl. In another bowl, whisk your egg and add the milk and oil. Whisk again. Add your dry and wet ingredients together, and mix gently until there are no dry spots in the batter, but no more. Pour a pancake into your heated pan or griddle. Add any mix-in’s you’d like to use. (I used banana slices and a few dark chocolate bits, Phil used some frozen wild blueberries. Watch for the bubbling in the batter to slow and stop. 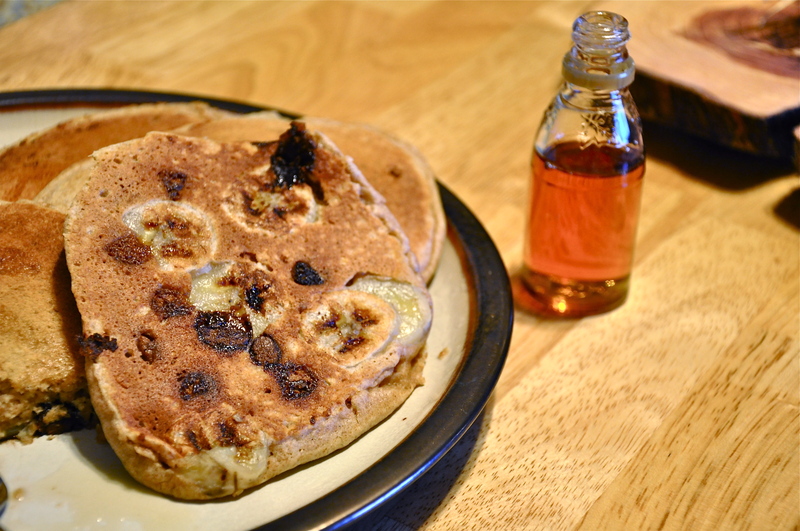 Note: I didn’t notice much bubbling when I made these, so I just used my spatula to check the underside of the pancake. When it was a nice golden brown color, I flipped and cooked the other side. This recipe makes enough for two people with normal appetites, but since nobody like that lives in my house, I doubled it. Enjoy! Oh man, I should stop subscribing to this blog because it is torturing me by showing me all the things I could be eating right now. I need you guys to help me out and do something creative with tempeh or tofu, the current staples of my diet, but that only uses a stove with two burners. Anyway, can’t wait to come home and whip up some of these gorgeous Vermont-style pancakes! I’m on it Bri! The current issue of Martha Stewart is actually full of tofu recipes, so I’ll take a look and get back to you! Thank you Nikki for taking such good care. My son is a very lucky man.